"This book includes the most up-to-date thinking, tools, models, instruments and case studies necessary to identify, lead, and manage talent within your organization and with a focus on results. It provides it allfrom thought leadership to real-world practice." "This is a must read for organization leaders and HR practitioners who cope with the today's most critical business challengetalent management. 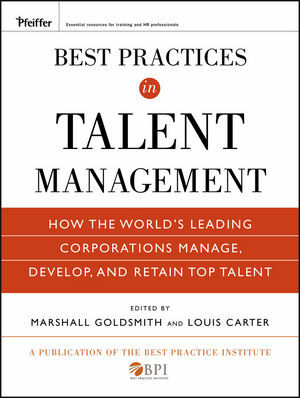 This book provides a vast amount of thought provoking ideals, tools, and models, for building and implementing talent management strategies. I highly recommend it!" MARSHALL GOLDSMITH, PH.D., is one of a select few advisors who have been asked to work with over 120 major CEOs and their management teams. A prolific author, his book What Got You Here Won't Get You There was ranked as the #1 best-selling business book by the The New York Times and The Wall Street Journal. For ten years, he served as a member of the Board of the Peter Drucker Foundation. LOUIS CARTER is the Founder and CEO of the Best Practice Institute, and a world-renown leadership and organization change advisor. He is the author of over nine books on best practices including Change Champion's Fieldguide and Best Practices in Leadership Development and Change.